Do you drive under the speed limit for fear of losing control of your vehicle? Does your steering pull to the left or right? Does your steering wheel shake you until it feels like your fillings will fall out of your teeth? Let the wheel alignment experts at Precision Automotive Service have a look. 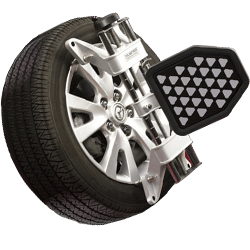 Your wheel alignment is a test in geometry, comprised of a few adjustable angles. Improper toe, the angle of the front of the wheels in relation to each other, can negatively affect your tire wear and steering ability. Improper camber adjustment, the vertical angle of the wheels, can negatively affect tire wear and your handling. And improper caster, the fore-and aft vertical adjustment of the wheels, can make the steering feel too loose or too tight. When a wheel alignment needs to be performed, one or more of these angles may need adjustment. Our ASE-certified technicians are fully trained to perform corrective wheel alignments with laser-guided precision equipment. Also, anytime suspension and steering components are replaced, a wheel alignment should be performed. Trust the staff of Precision Automotive Service to accurately and quickly perform your four-wheel alignment. For all your wheel alignment needs, see the steering and suspension experts at Precision Automotive Service in Sacramento. Call us today or fill out the online appointment request form to book an appointment.